As armed forces around the world look to implement their Network Centric Warfare capabilities the ways in which information is delivered to front line troops are becoming increasingly diverse. 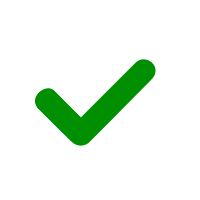 After many years of relying on analogue radio systems to deliver voice-based information and commands the new approach now also involves the extensive transmission of data over satellite, wireless, mobile, cloud, wide-area and similar networks. 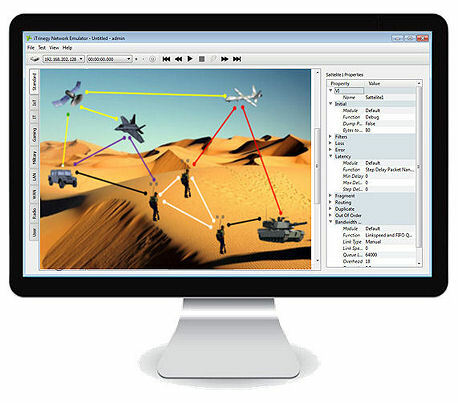 iTrinegy network emulator are being used by leading global defense sector contractors, as well as the US military and British MoD to develop simulated IP network environments that can be used to test the resilience of IP-based systems and equipment before they are actually deployed in the field.Ways in which these products can be deployed include testing the performance of technologies focused around Network Enabled Capability (NEC) or Network Centric operations (NCO), C41 / C4ISTAR systems or any field based TCP/IP communication systems including bespoke military protocols and applications, VoIP (Voice over IP), IP over Wireless and Radio over IP (RoIP). 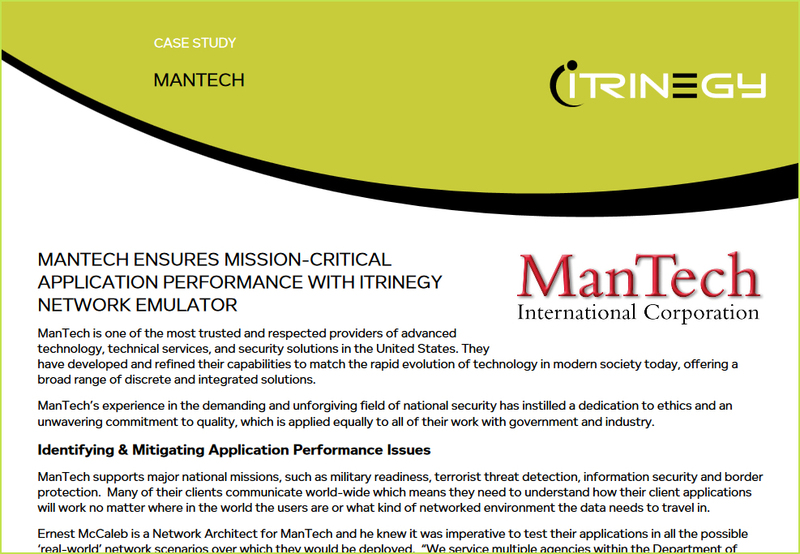 Given the complex nature of the networks our military customers are often trying to recreate, our engagement with them typically involves a comprehensive consultation from our Security-Cleared Network Experts to ensure their requirement is fully analysed, understood and deliverable. 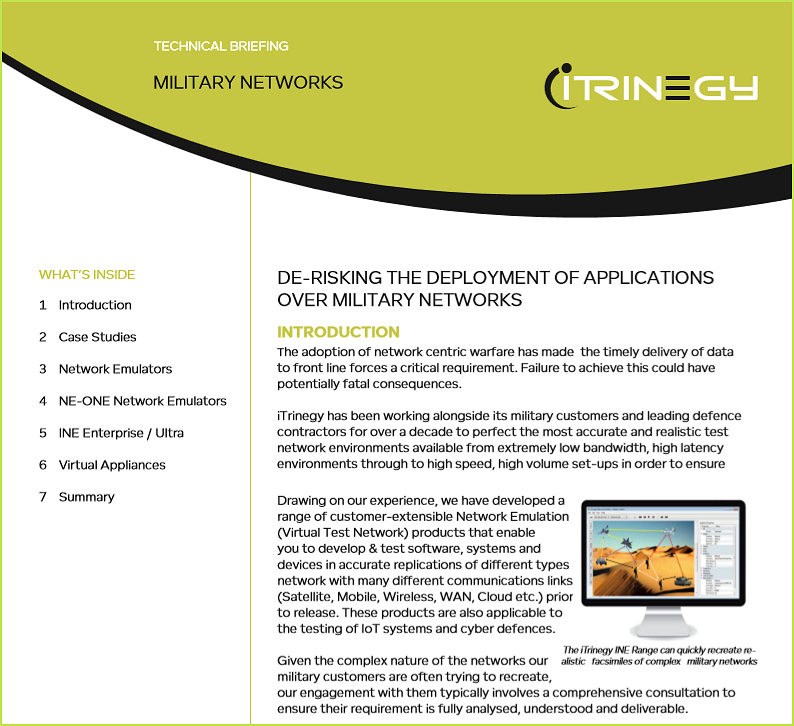 Soldier Modernisation talks to Frank Puranik from iTrinegy about how their Network Emulation technology helps the modern dismounted soldier.